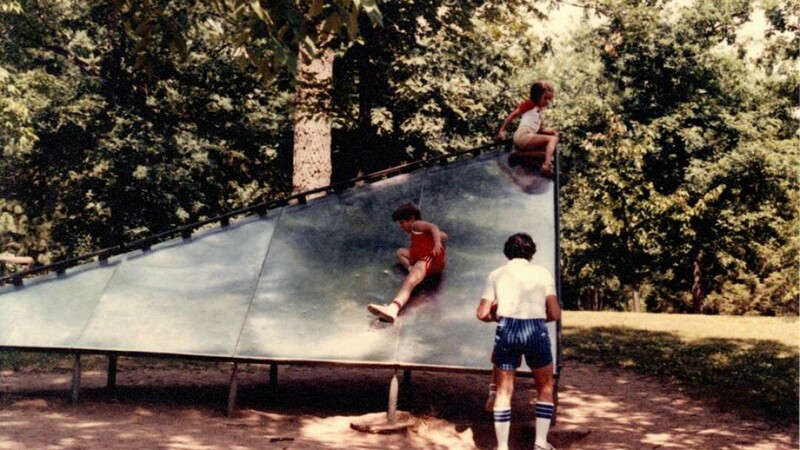 Hey, remember the giant razor blade-like “slide” that used to be in Carson Park? What meth addict designed that thing? It was a giant triangle of super-polished metal propped up at an angle, capable of absorbing the sun’s beautiful rays and converting them into astounding amounts of knee-scorching heat energy. There was no ladder to get you to the top – you needed to either a) run up the thing extremely fast, b) scale the edge of the slide using a tiny railing, or c) rely on the friction of your bare skin against the smoldering metal to assist in your ascent. It was the most frustrating, elbow-bruising, noggin-clunking, ego-crushing piece of “play” ground equipment ever created. This thing was forged (in the fires of Mount Doom, no doubt) long before the numbingly safe playground equipment of today. Modern day equipment looks like it was made by Rubbermaid. Or Tupperware. Or both. The Razor-Slide of Aggravation would probably give today’s soccer moms a panic-induced aneurism. Besides its striking resemblance to a Jolly Green Giant-sized guillotine, there weren’t even any woodchips around it. Only sand. And piles of moaning kids. Sure, today’s equipment looks like plenty of fun (and I rarely see it filled with bored, listless kids staring off into space), but the jungle gyms of old seemed to be a lot more open-ended and more imagination-friendly. Many of today’s playground apparatuses lend themselves to only one or two forms of play.